I first saw the property we now live on, in early May 1974. I worked at a weekly newspaper and lived in the trailer. The wages I earned then along with what Jilda earned as a clerk in the dress shop put us just over the poverty level, but we dreamed of a place of our own. I'd heard about a woman in Empire that wanted to sell an old farm along with a small amount of property. The day was warm and when I stepped out of my old Plymouth Valiant, I got a whiff of wild honeysuckle. I parked up close to the mailbox and set out down the road toward the old home place and barn. The hollow was painted with dogwood, wild hydrangeas, and redbud trees. I could hear water gurgling as it flowed over rocks. The oak, hickory, and poplar trees with low-hanging limbs transformed the red-rock drive into a lush green tunnel that seemed cooler than the air outside. Time seemed to stand still as I walked down that path, absorbing every detail. I knew that moment that I wanted to spend my life in this place. I had no idea how, or when, but those things seemed irrelevant. I just knew. As it turns out, Jilda loved the place as much as I did. So did her dad. We didn't have the money, but he did. I'd hoped he would lend us the money, but that didn't happen.....for several years. The old place had been a rental for years and the folks who rented it treated the land badly. They were junk dealers and at one point, there were pieces of old cars everywhere. Most of the big pieces had been hauled away before my father-in-law took ownership, but there were still hoods, doors, hubcaps and smaller pieces scattered around the property. After Jilda and I had been married many years, her parents deeded the land to Jilda and me. He'd also bought the adjoining property and he gave that to Jilda's brother. Through the years, we made many improvements, planting trees, shrubs, and flowers. We made improvements to the old house and barn. We also hauled off tons of junk left by the tenants. But there were a few things I left intentionally. 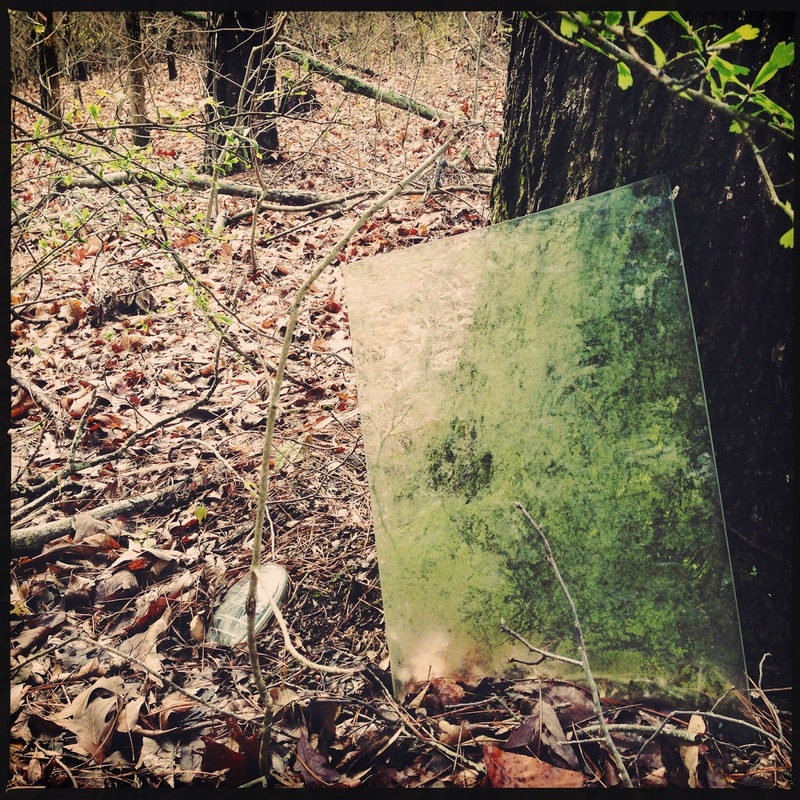 Leaning against a hickory tree is a side window from a car with an old headlight nearby. I left it there to remind me how far we've come. Jilda's brother, two of his kids, his grandkids, and our friend Fred lunched with us today. Jilda outdid herself again. Afterward, we hid eggs for the grandkids. It was a fun day. I hope yours was as blessed. I love a story of dreams. I am a firm believer of deams. Yours and Jilda's were (are) neat. I love to relax here and walk with you. Today is special, I could see the place. To fulfil a dream one must see past the garbage and junk and see WHAT IT WILL BE. I love that. I am giving my nephew some labor, I know you know what a mill house looks like, when mistreated over the years. I see this guy dreaming to see his Grandma's house again. PS: I meant to say, I like the memory markers. That is neat. The gathering of family and the hiding and hunting for eggs are what I remember most about Easter. It had to be a good day. This reminds me of my own son and DIL! Tho' she was born and raised in Alabama, he's fallen in love with the land. Presently, they're at a threshold much like yours and Jilda's ... much land needing TLC, but the desire is keen. I was going to comment on the old touchstones (don't you hate it when you suspect a word isn't right?) ... but Jack said it best. Memory markers, yes! Some things are just meant to be and somehow we find a way to do what our heart tells us to do. I love your story and I love that you've left a bit of the past too....Happy Easter to you and Jilda! I envy you; I've yet to find a place I never wanted to leave. Ten years is my maximum, so far. I feel like I was over for coffee again after reading this!! How wonderful your dreams came true. You both are blessed to live in such a wonderful place. I would have never thought to leave a memory marker in place, but do agree it is a nice touch. Loved the post, but your memory of "hauling" out the junk reminded me of my own property. The man who built the neighbor that adjoins our farm left a whole lot of construction and farm junk here. We were hauling out stuff for years.